Jinja SS headmistress Diana Nyago (left) and team CEO Ahmed Kongola unveil the club new coach Hamza Kalanzi (2nd left). Courtesy photo. 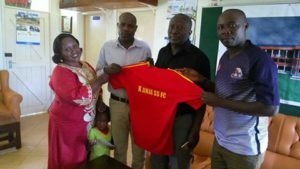 Kirinya-Jinja Senior Secondary School Football Club a top division club based in Jinja at Jinja SSS has today Monday appointed Hamza Kalanzi as the new head coach, ahead of the forthcoming Azam Uganda premier league season 2017/2018 that is due September this year. In the presence of the club patron Hon Gume Frederick Ngobi, club president Madam Hope Diana Nyago and the club Chief Executive Officer Ahmed Kongola, the former Villa and Lweza FC tactician has penned a two-year contract with the team until 2019. He will be deputised by Zungu Hassan and Hannington Kalyesubula who will serve as the goal keeping coach. Kalanzi’s predecessor Abey Bogere Kikomeko has been appointed the director of the youth programs of the club. “I am delighted joining one of the best football clubs currently in Uganda with good football structures, can’t wait to get started,” Kalanzi said. “Jinja SS football team has great potential and joining this big club is a dream come true,” Kalanzi added. “Kalanzi is one of the few talented football coaches with vast experience in Ugandan football every team would wish to have as their head coach. We will give him all the necessary support and backing in the execution of his duties at KJSSFC,” Kongola said.